A lipid is a non-soluble molecular organic compound comprised of hydrogen and carbon. As far as their purpose in the human body goes, lipids are of crucial importance for both energy storage and cell membrane development. Plants and animals alike contain lipids which they depend on for energy. Gram for gram, a lipid contains more than twice the amount of energy found in carbohydrates. In a body that weighs around 150lbs, around 22lbs of this weight will on average be the body’s lipid content. And this is precisely why a human being will often be able to live for several days without ingesting any food and only a minimal amount of water. Triglyceride molecules are made from three molecules of fatty acids and one glycerol molecule. The fat can be either unsaturated or saturated. Triglycerides are able to float in a cell’s cytoplasm since they have a lower density than water and are non-soluble, as is the case with all lipids. A triglyceride will be classified as a fat if it becomes solid at a temperature of 20ºC, otherwise that are classified as oils. Triglycerides are crucial in the body for energy storage. Steroids have a structure that resembled four rings fused together which are made from carbon molecules. A few types of common steroids are cholesterol, testosterone, vitamin D2 and estrogen. Steroids benefit the body by helping determine and control the structure of plasma membrane. 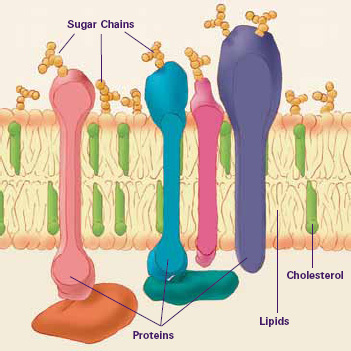 Talking about function of lipids, you should know something about Phospholipids. Phospholipids earn their name as their constitution is primarily phosphate groups. They contain molecules that both attract and repel water, playing a key role in constituting cell membranes. Short sugar chains form glycolipids, which can be found in a cellular membrane’s exoplasmic surface. They play an important role in boosting the body’s immune system. A lipoprotein is a combination of proteins and lipids found in a cell’s membrane – examples being antigens and enzymes. Lipoprotein help fat move around the body in the bloodstream and exist in the form of Low Density Lipoprotein (HDL) and High Density Lipoprotein (LDL). When it comes to function of lipids, waxes must also be included. Along with a chain of alcohols, fatty acids are found in waxes. These are extremely common lipids and can be found on animal feathers, in human ears and even on the leaves of plants. Their primary function is one of protection.